I heard a lot of negative reviews about this novel so when I finished The Privilege of the Sword, I was a little apprehensive. However I loved this book because of the folklore and the mythology behind this novel, this made The Fall Of The Kings, last book of the Riverside series, my favourite. I have always loved the idea of the Oak King and his Holly King, which has been explored for many centuries. I read this one last and I think this is why I enjoyed it so much as everything made sense and I saw how this book links all the others together. In the other book is the Riverside series we hear about the Kings but they are seen as a negative figure. However in The Fall Of The Kings we see that the Kings have been trying to emerge for centres but the Wizards are still sleeping. This made me consider that maybe the reason that Alec was thought of as mad was because of the King blood running through his blood line and only Richard could keep him sane? (I don't know I'm just speculating). This novel is written 40 years after The Privilege of the Sword, and the main protagonists are Basil St Cloud, a University professor of Ancient History and Alec's son Theron Campion. They become lovers but Basil's research leads him to explore a history of magic that has been trampled on and made to look negative. However Basil wants to understand the truth, and therefore this book is deeply entangled in dirty politics, and the history of magic comes to light and the nobel's power is questioned. Kushner takes old mythology and folklore and makes it new in a story that weaves politics, love and sexuality, scholarship and magic, and ancient ideas of kinship and leadership into a rich tapestry that moves the reader into believing that this history could have been real. 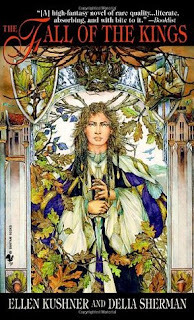 The prose in this novel is written beautifully as the reader is taken almost dreamlike through the Grove back into a time where magic was freely used and celebrated. This novel really reminded me of Greenwode as the same concepts are explored. Brilliant novel in a brilliant series.